Arizona. I so enjoy walking about Saguaro Cactus. They are the snowmen of the desert. Some stand in solemn splendor while others lean in to say hello to the world. With the variations on the number and the slants of projectiles on each Saguaro Cactus, it seems sure they were created on days when there was nothing else to do but play outside. I highly recommend you take a walk amongst them for yourself to see if you agree. 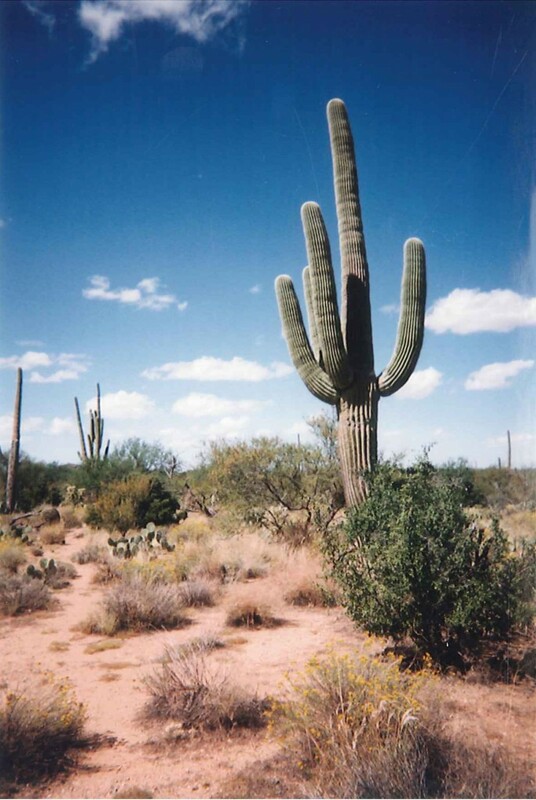 While many are found in the Sonoran Desert in Arizona, they pop up in many places in the Southwestern USA. The towering folk of the desert stand. You never see them seated. They are still, but the sandy floor holds underground prickly cactus so that even I grab my sandals before venturing far. Sometimes loners and other times in clusters, the Saguaro command attention either way. They are the tall trees in these parts yet they provide no shade for me. Experience has taught me to take care in using them as a marker as their looks change depending on the angle. They stand erect in the sun-drenched heat looking as cool as a cucumber, no mortals they. The Saguaro stiffly mark my presence. I get the impression they find me of little consequence. More information on the on the Sonoran Desert.